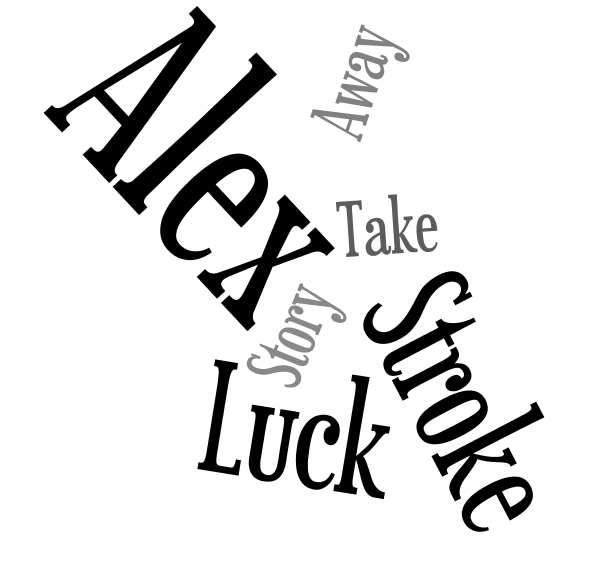 A Stroke of Luck | What is your greatest take away? What is your greatest take away? I provide mathematics professional development around the country and I often close my sessions with participants sharing their greatest “take away” from our time together. In those types of sessions a take away might be that we need to support students to persevere in solving problems, share their solution strategies, or make sense of one another’s thinking. It is helpful for participants to put into words what they will take with them from the workshop. It is important to me as a way of determining if my goals for the participants were met. 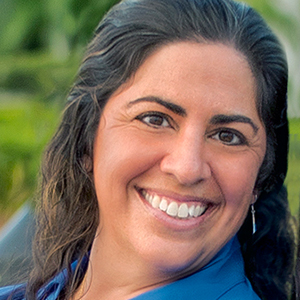 As we move toward the end of 2013 and prepare to begin a new year, I’d like to share with Alex how her story has impacted the lives of others. She so often shares how other people are important to HER. Now I’d like to know what YOUR greatest take away is from Alex’s story or, if you have been fortunate enough to attend one of Alex’s presentations or even if you know Alex personally, your greatest take away from knowing Alex. We are asking everyone who knows Alex or Alex’s story to share their greatest take away regarding Alex in 20 words or less. We will collect these “Alex Take Aways” for one week and then post them on our blog and FB page on Friday, December 27th. You can email your take away to julikdixon@gmail.com or include it here as a comment. I will compile what is shared and make a Wordle to post on this blog. 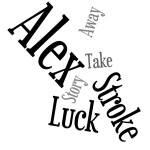 Be sure to follow the blog by clicking the FOLLOW button on the upper righthand corner of A Stroke of Luck’s webpage so you will be alerted when the Alex Take Away is posted. Please help us spread the word. I have had the pleasure of meeting Alex while working at her school. Never once have I seen Alex without a smile on her face :0) Her smile brightens my day and I am reminded of how special every day is that we have with our families. Thank you Alex! For being you and not giving up!! Stephanie, Thank you so much for your kind words. Which 20 words would you like us to use for your contribution? In my words: Alex is the most caring and selfless person I have ever met and she greets everyone with a smile.